Dylan is very passionate about the ocean and all of its inhabitants. He spends a lot time at the local aquarium and one day hopes to be a marine biologist. When he heard there was a campaign to bring otters to the Biopark, he immediately wanted to help. Dylan would like this painting to be auctioned off with 100% of the proceeds benefitting the otter exhibit. 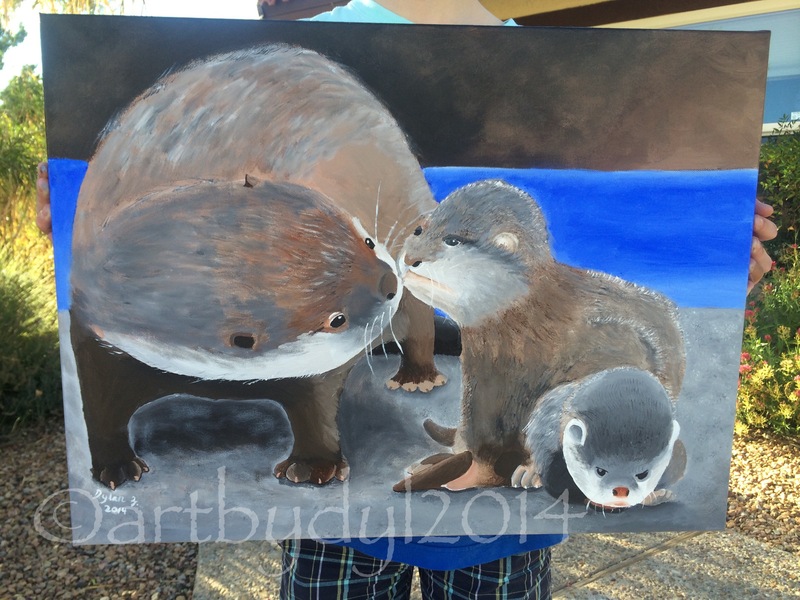 This entry was posted in Amazing Talent and tagged aquarium, Autism, Biopark, Kids, New Mexico, otters. Bookmark the permalink. Dylan, I think this is the most amazing piece you’ve done so far. I LOVE it and I LOVE YOU….don’t ever give up your passions and gifts!!! Dylan, otters are my favorite animal! I love the way this piece depicts their nurturing characteristics. Great work! I’d like to bid for this piece when it is up for auction. Love your work. I follow your progress as an artist every month. Well done. Uncle Jerry Greiner, Cindy’s brother.